DIETRICH'S GUESTBOOK IS COMPLETELY BROKEN AGAIN! Ignore the following paragraph... you can't write to it... sorry!! Welcome to my guestbook! As you may be aware, for several months this guestbook was unable to accept new comments. 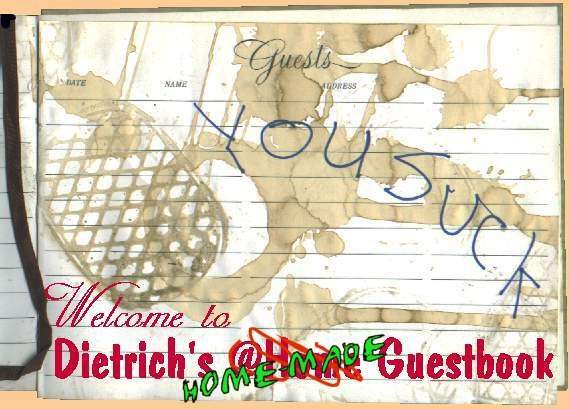 I first developed this guestbook as an Excite@Home Personal Website feature. A mere couple of months later, the Great Dotcom Collapse occurred, Excite@Home went under, and I had to move this website to AT&T Broadband Internet. (That's what that bewildering domain name "attbi" in my website address stands for.) Unfortunately, the canned guestbook AT&T provided was a miserable, clunky, amateurish, advertising-ridden piece of garbage that I wouldn't put on my dog's website -- plus, I couldn't even move my old guestbook comments into it. 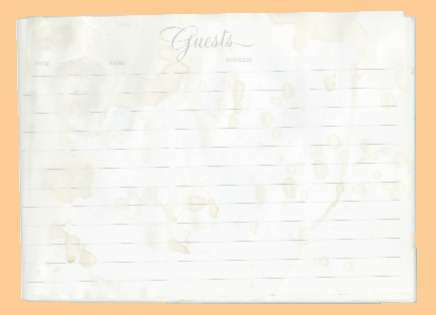 So, fine, I thought -- I left my existing guestbook as an inert, unchanging page, until I could "roll my own" guestbook. I cracked the books and learned CGI scripting, modified a freeware script by the honest folks at BigNoseBird.com, and with the help of Richard T. and his Midgard computer, I've once again got a guestbook you can write stuff to! Please add your comments to this guestbook! I spent a long time getting this stupid thing to work, so write something intelligent! Just kidding. Just write something . . . let me know that someone is out there . . .
Hi, such a natty website to reckon with. I immensely enjoyed reading the Trans-Siberian journey. Oops..some secrets were revealed in the guestbook...all in jest. niece website dude! My moniter isnt grate, but Is that a tom wates album cover in the photo? the one wen he was in italy? stay cool dude! chow! What the hell how did I get here and where are the thumbnails. It is great to be you guest. I must say. Great. Positively fabulous. Top of my day - actually my week... maybe this month, but I would not want to be accused of exaggerating. You know that plaster of paris bust of colonel Klink that I gave you for your birthday, you know, the one you keep on the nightstand next to your bed? Well, that little, red, blinking light in the monocle is a webcam! Ha! Ha! You pervert!! Ha! Ha! My friends and I saw what you did! Ha! Ha! Ha! You sicko! Ha! Ha! Ha! I'm gonna tell ROB! Ha! Ha! Ha! Ha! Ha! Kudos, Dietrich! Very artistic, and edgy... as you are, my friend! I have some funky pics from your party that might be a hip addition for your website. Ciao for now!